Our friends Tim and Michelle Williams moved into a local house a few months ago. In the garage, they found a jam jar containing the bones of a squirrel and the remains of its rotting flesh, dated 1985: presumably a zoologist lived in that house 28 years ago, began preparing a specimen, and moved out before finishing. So there is it: the tooth literally could not be any bigger. Rodents: they’re not quite as dull as you think. 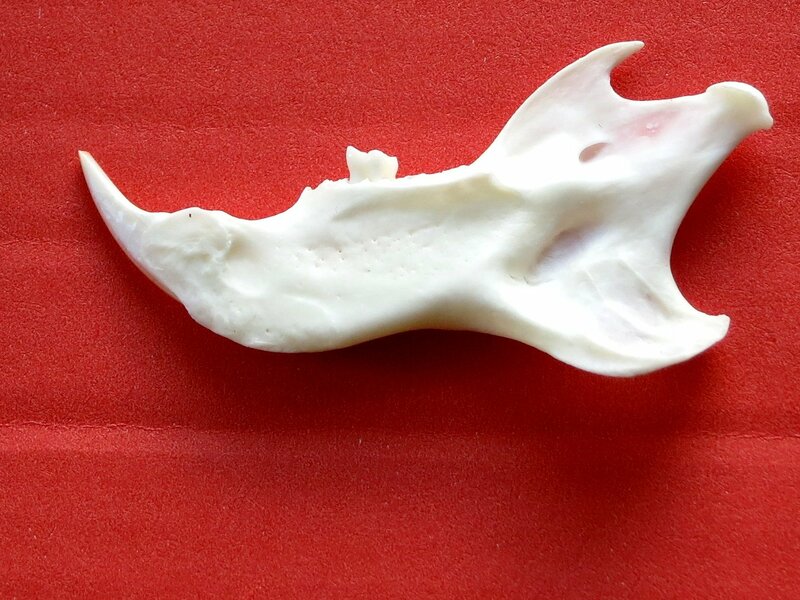 As you examine the lateral aspect of the mandible, you see a bowed ridge arcing towards the temporal process. This always marks the root of the incisor. While the premaxillary incisors are not as long, they are still fantastically huge, and the root extends along the dorsal margin and medial to the roots of the molars. Ridiculously awesome choppers. Why do big teeth sometimes have such deep roots? Is there some advantage to having the root far away from the end, or facing in a different direction, or something? I think the point with rodent incisors is that they are constantly, and rapidly, being worn away at the crown. So they are growing up from the root to replace the abraded matter. Yeah, but does a growing tooth need a deeper root? Other big teeth, like canines and elephant tusks, also have deep roots, so maybe it’s about withstanding force, not growth? Here’s where my near-total ignorance of rodents comes home to roost. well, for one thing what you get with such a curved and huge tooth is a very even spread of forces on the jaw – and have you noticed how little bone there is around that huge tooth? I suspect it is a mix, but with growth probably more important, especially with the incisors. I’m not sure how mechanically a highly curved socket would respond to forces vs the generally relatively straight sockets and roots of canines and ? It’s partly that shape to leave room for the roots, as Jaime mentioned for the premaxillary incisors (and presumably also maxillary, and some other other bones copted if they reach some ways back along the skull!). And as it needs to curve away from the roots, and also be curved at the tip for the ‘self sharpening’ aspect (tougher enamel on one side only so it wears into a point), it has to curve all the way to the base as enamel and dentine can’t change shape once mineralised, and so need to be curved as soon as they are formed i.e. you can’t have a curved tip and straight root as the straight bit would soon be the tip and the wrong shape! Mike – can you see how deeply the molar root(s) go without wrecking the jaw? Sometimes if the bone of the dentary is thin enough just holding it up to the light – or shining a more powerful light straight through – makes for a cheap low tech X Ray/CT scan image, with the denser dentine of the root visible through the less dense bone! We just had a great talk today at our Palaeo group meeting in Helsinki about mole rats, some of which use evergrowing incisors to dig their burrows with. When kept in captivity, the incisors need clipping once a week or more – more often than your fingernails! Tooth dentine and enamel needs time to mature – basically to condense out the water from the protein matrix between the mineralised apatite crystal prisms – and I suspect it’s this process that needs time when the wear rate is so huge. In small fast living rodents like mice, the mineralisation takes up to 20 days for a relatively small molar tooth, and the maturation probably a bit on top (it’s a wave like process so some parts are still mineralising while others have already done so and are then maturing). We’ve also got some bamboo rat skulls in the lab I’m about to CT scan, the lower incisors are even more insane, the bump you see in the squirrel for the stem cell niche/pocket where the incisor grows from at the very end of the root is even further back towards the condyle… Oh and a neat paper from 2011 showed one species of mole rat to have both hypsodont or evergrowing molar teeth as well as incisors, as do voles, but also continuous molar tooth replacement from the rear, as with elephants, manatees, one species of wallaby – guaranteeing that there will always be ‘fresh’ relatively unworn teeth through the animals relatively long lifespan – 10 to 18 years for relatively small animals, as they have developed proteins to cope with the low oxygen tunnel environment that just happen to work well as anti-cancer agents too! Of course dinos got around that by really fast replacement of individually rather dull teeth – sauropod teeth especially, though the recent paper on dental tissue types in hadrosaurs showed at least some dinos being a little more adventurous with their teeth, though I’m not certain that counting tubules or holes in the mineralised tissue as an additional tissue type above those found in mammals wasn’t a bit of a low blow. (But obviously not as exciting as tritylodontid teeth – though some rodents did slavishly copy their design cusp for cusp a mere 100Ma after tritys disappeared). Heinrich – any idea as a bio-mechanist how forces would differ on a curved vs straight root, as above my suspicion is it’s that they require a) root clearance and b) the curve for maintaing shape at the tip? And i.e. elephants seem to have relatively uncurved tusk (incisor) sockets. 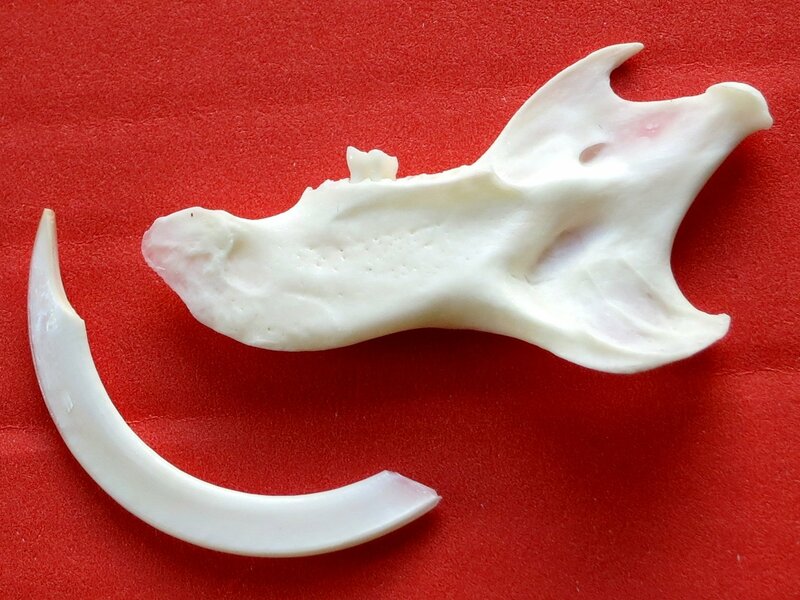 I’d also say the bone isn’t ridiculously thin/reduced – for a small mammal at least – and towards the front near the (fairly large) symphysis and area above it actually looks more robust than in less well endowed (with incisors!) mammals. But in absolute terms, of course the hugely long root would spread forces across the jaw, so perhaps I understated that in my first reply. As with many of these things, it’s probably a locally optimal compromise between many different aspects that in isolation would probably be even more ridiculous! Minor comment – long-rooted aradicular (= no closed roots) incisors of this sort are typical for rodents (those of lagomorphs are similar but much shorter). I always thought that the stupidly long, arc-shaped roots of rodent incisors were to do with counter-acting stresses incurred at the crown (some rodents use their incisors like picks or levers): this is mentioned in a few places in the literature (e.g., Kloehn 1938) but I don’t know if it has been demonstrated. Kloehn, s. J. 1938. The significance of root form as determined by occlusal stress. The Angle Orthodontist 8, 213-230. Another issue is that, if the tooth is continually growing, there’s going to be a region of rapid cell division. In plants, at least, regions of rapid cell division (like the cambial layer and buds) are weak and easily sheared off or crushed. One might hypothesize that it’s useful to get the rapidly growing young tooth tissue as far away as possible from the region experiencing the maximum tooth-destroying forces. Ideally, the growth should be in a different direction to those destructive forces, too (so that they aren’t affected by transmitted forces). A long arc of tooth, well-buttressed by bone, would help to do that. Similarly hypsodont and curved teeth occur as premolars and molars in wombats. Didn’t know that, but I’m sure it should have come up in one of the many seminars and talks on tooth ultrastructure I sat through in Germany 20 years ago; or maybe not, as they all seemed to assume a lot of prior background and a rather static view of morphology.